My mother was talking to Logan about the “super moon”. She knows that Logan went through a period of time when he was obsessed with space, wanted to be an astronaut and would randomly tell you facts about planets and stars when you least expected it. It’s pretty standard behavior coming from a child on the Autism Spectrum. When they are interested in something, they live and breathe it and consequently everyone in the family does as well. It is as if nothing else matters. I’ve seen the pictures on Facebook of the super moon and some people have really gotten into it, documenting it everyday but honestly I didn’t think much of it other than it looking like another full moon. My mother is stressing to Logan, with good intentions, that it’s important for him to see this super moon because the next time the moon will look like this he will be twenty-three years old. We went about our lives, I taught an evening yoga class, the kids watched thirty minutes of a movie before the bedtime routine of teeth brushing, showers etc. 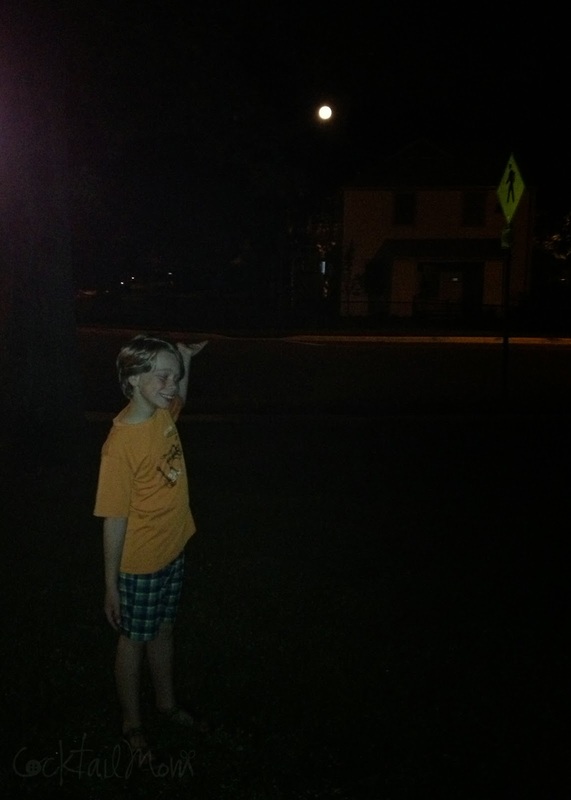 The super moon by bedtime had slipped all of our minds, except Logan. Thirty minutes after putting him to bed I could hear him pacing in his room. This wouldn’t be the first time he’s paced when he should be in bed sleeping, typically when he’s anxious about something happening the next day he can be found pacing while his little brother sleeps soundly in the bunk bed above him. At 10 pm as I was walking upstairs to head to bed myself I saw out of the corner of my eye this flash of pajamas leap into bed like Superman. It’s the classic maneuver we have all tried to pull off, when you leap chest first, eyes closed into bed to try and fool your parents that you’ve been asleep the whole time. I go into his room and tucking him in under his sheets, “Logan you need to be asleep. It’s too late to be up.” He opens his eyes and with a quiver in his voice, I notice the tears starting to form. “But we didn’t see the super moon. And I’m going to miss it!” That’s when I notice that the curtains have been pulled back. He’s been up here in his room freaking out about not being about to see the moon, pacing to the window. My heart instantly breaks for him. Shoes on, wallet, keys…. we are on a super moon hunt just my son and me! “Huh? I forgot you at the house?” Completely shocked that this memory has anything to do with me. I’d never forget my kids. I don’t remember the actual night that Logan is referring to. I trust his memory though. His autism “gift” is having an impeccable memory and I have no doubt that this event occurred. When things were at the worst in my first marriage there were a lot of tears. I’m not the type of person who has breakdowns in front of others, crying is typically done in private. I save crying for driving, doing the dishes and if I happen to be in public thank God for dark sunglasses. During the separation and divorce I tried to have my breakdowns when I thought the kids wouldn’t notice. Boy was I wrong! Kids notice everything. As I point and try to wrangle the minivan into a parking space we hop out of the car to get a better look at the super moon. I look at Logan and we are both grinning ear to ear. This is the memory I want him to remember and replace that old one. This was so beautiful and touching. Thanks for sharing this experience with us all.